Made without any eggs and dairy, this Victoria sponge is filled with a generous layer of dairy-free vanilla buttercream and strawberry jam, making it the ultimate indulgent treat for afternoon tea. 1. Preheat the oven to gas 4, 180°C, fan 160°C. Grease and flour the sides and line the base of 2, 9 inch loose-bottomed cake tins. 2. Sift the flour, bicarbonate of soda and sugar into a large mixing bowl and mix together. Whisk together the sunflower oil, milk, syrup and vanilla in a jug and pour the mixture into the dry ingredients, then whisk using a hand-blender for 2 minutes until thick and creamy. 3. Spoon the mixture into the prepared cake tins and bake for 35–45 minutes until risen and cooked through. Remove from the oven and leave to cool for 15 minutes in the tin, then remove and leave to cool completely on a wire rack. 4. While the cakes are cooling, make the filling: beat together the spread, icing sugar and vanilla in a mixing bowl, cover and leave to firm up in the fridge until needed. 5. 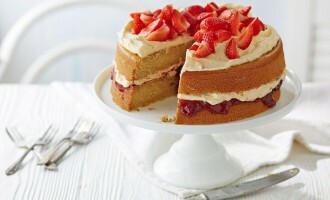 Spread the jam evenly over one half of the cake, followed by two-thirds of the cream mixture. Top with the second cake, spread the remaining cream on top and decorate with the strawberries.